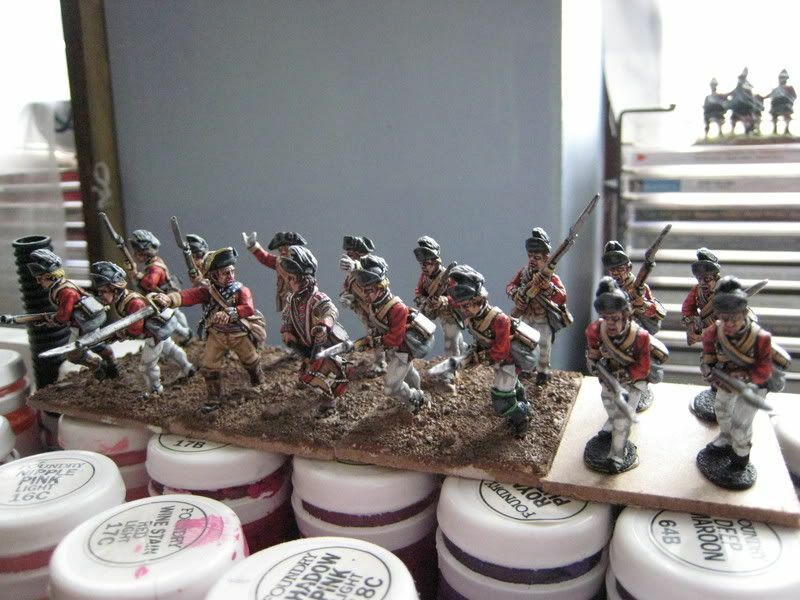 Thanks to the ever-increasing demands of work I haven't managed to finish off the basing of the 62nd. And I haven't finished painting the 84th. Annoyance. 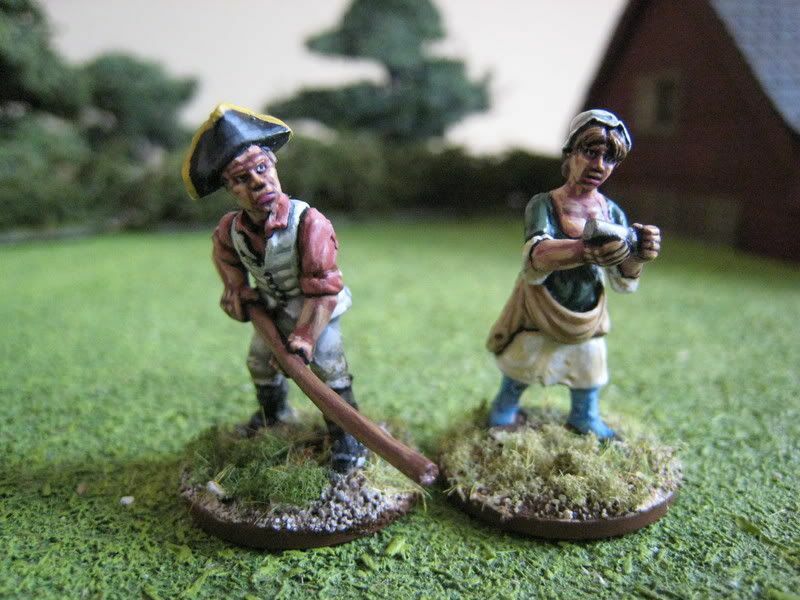 In fact, as I'm now going to be away until 2 April my tally for March will be only 13 painted figures. 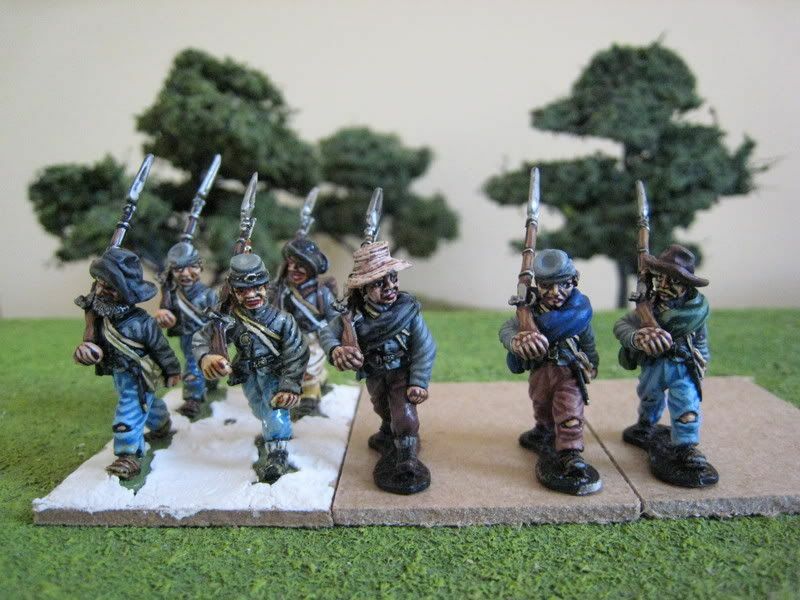 What I did manage to do, however, was start on a regiment of Rebs for the ACW. 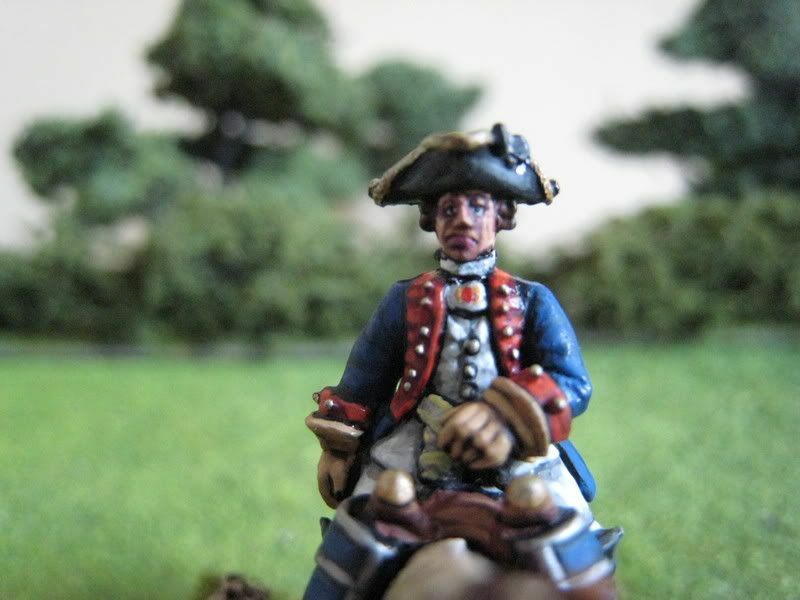 I have long been interested in this war and bought my first Dixon Miniatures figures about ten years. I painted about two dozen shortly thereafter but they have sat in their box until fairly recently (actually, that's not entirely accurate - they did form part of a display that I put up in the office I sat in as a first year trainee; my supervisor had all kinds of toys on his desk so I thought I had better contribute something). 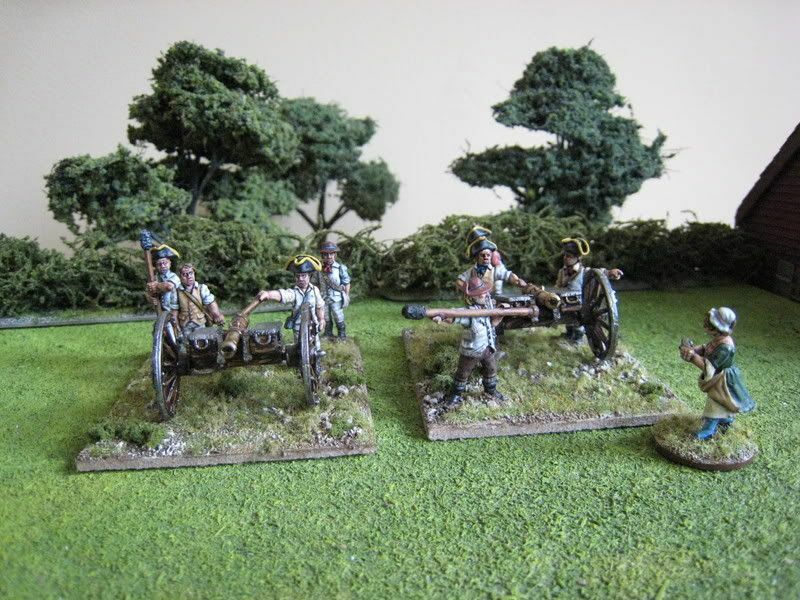 The impetus for digging these out was the release of the Genereal de Brigade variant "Guns at Gettysburg". 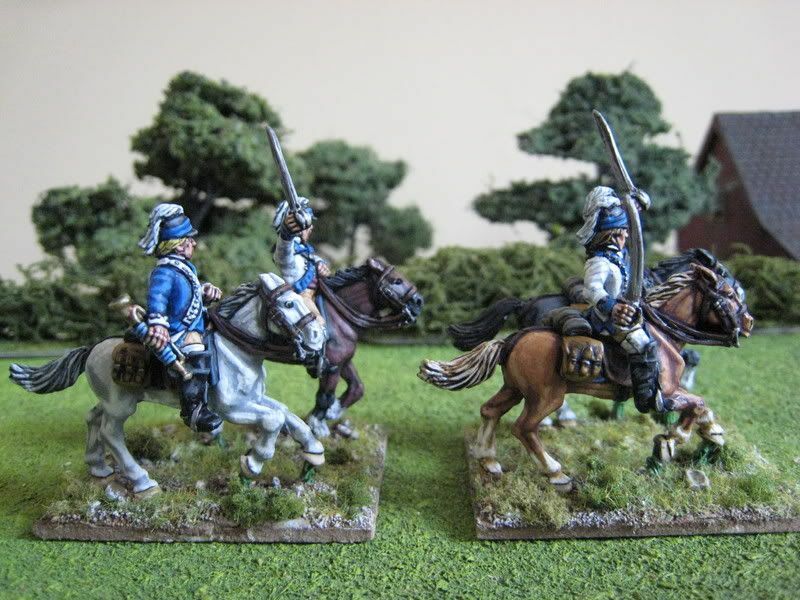 I have enough painted figures for 3 regiments and I will slowly tart them up over the next few weeks. So in the absence of anything else I thought I'd put up some work in progress shots. Three of the figures were painted over the past couple of weeks, the others 8-odd years ago and touched up slightly. People seem to either love or hate Dixon figures. 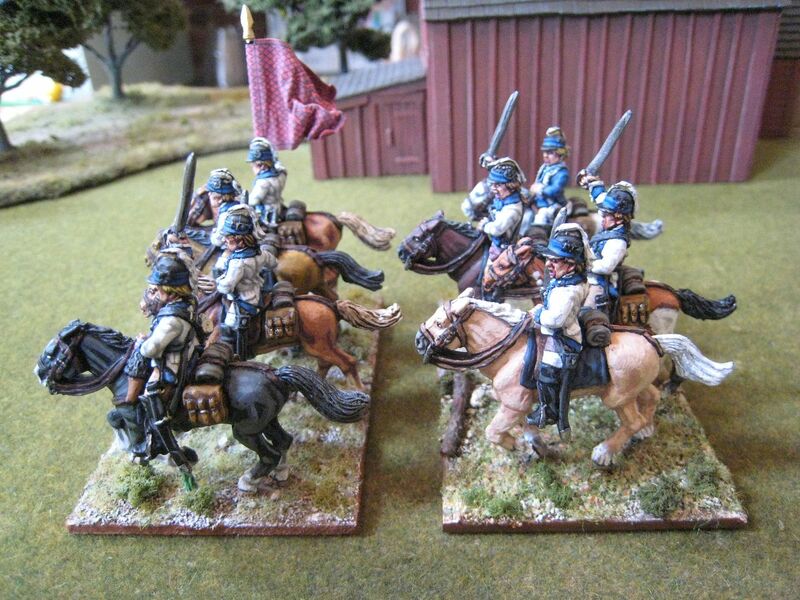 I love them as they are dead easy to paint and the variety in their ACW range is staggering. At 95 pence per figure they are also at the cheaper end of the UK metals market. 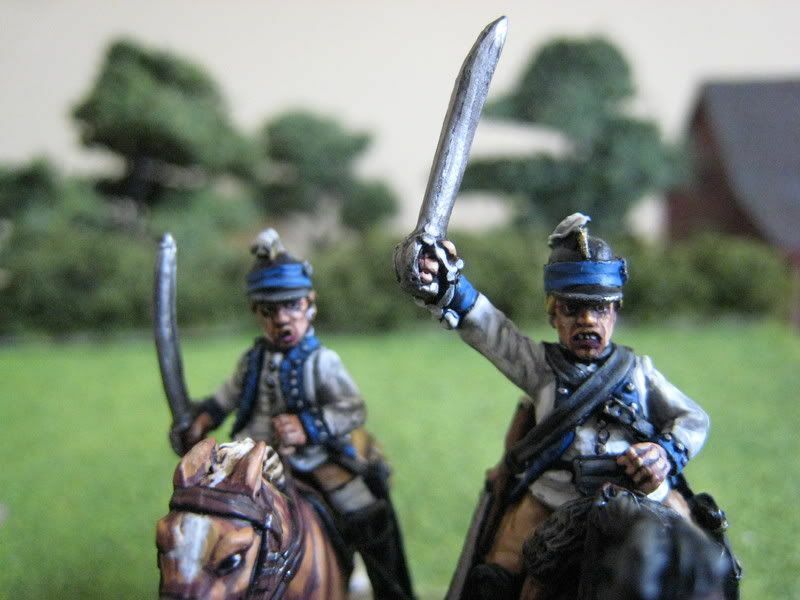 Some have said that the advent of Perry plastic ACW figures will be the death-knell of other ACW metal ranges. I do hope that is not the case and I doubt that it will be. I'm flying off to America tomorrow so no more posts for 2 weeks. We have a week in Boston and then a few days in Charleston. When I return I will be armed with dozens of AWI themed photos! 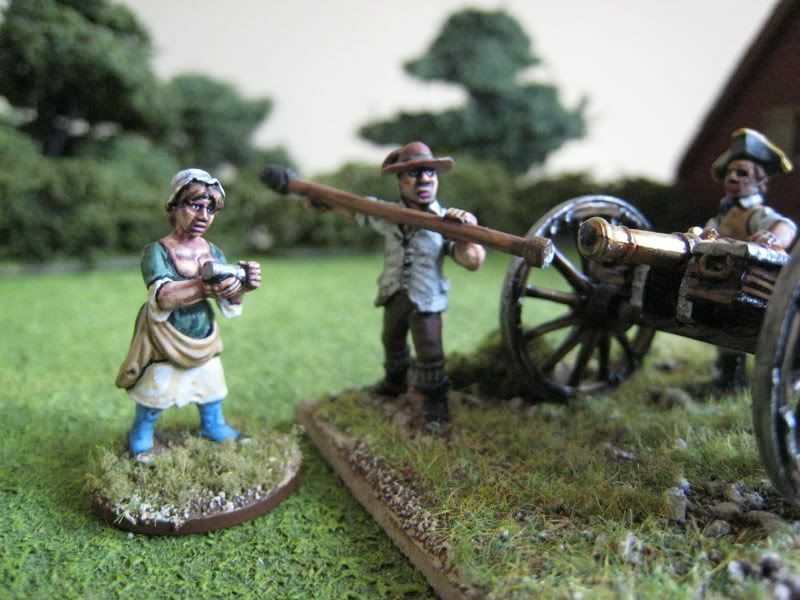 Nic Robson gave me permission to put up these photos of the forthcoming Eureka "Molly Pitcher" and Continental artillery figures. The gun pieces are by Foundry but all the "humans" are Eureka figures. There are two crews, one loading and one firing. 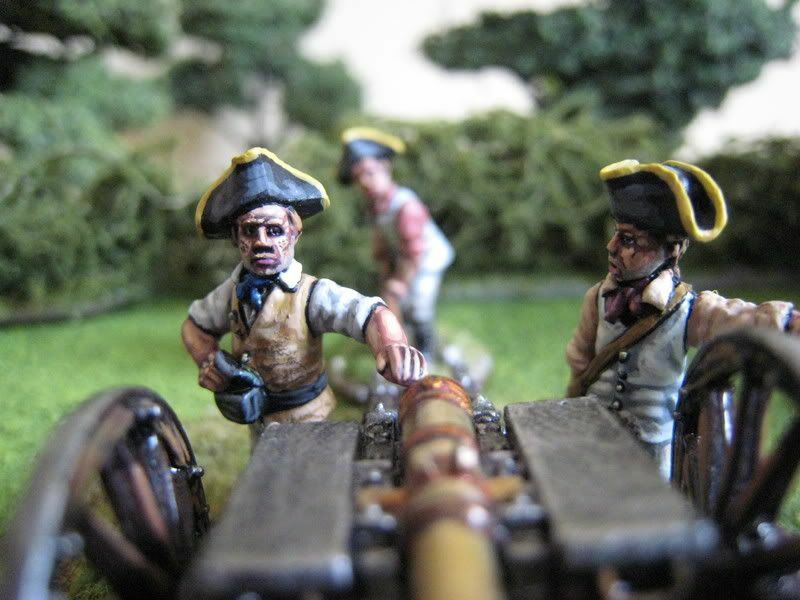 The figures are in shirt sleeves and I think capture very well the look of artillerymen in the thick of action. I strongly suspect the poses are taken from the Don Troiani painting of Molly Pitcher at the Battle of Monmouth; see here. Note the pose of the chap with the ramrod who is in an "overarm" position rather than the usual "underarm" pose that most manufacturers use; this pose just looks so much more intense and makes me wonder why the underarm pose is more common. 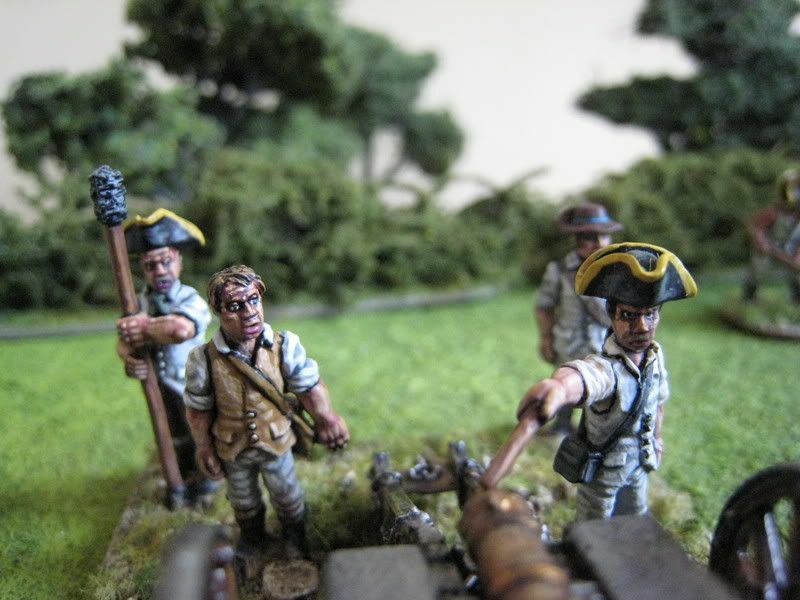 I particularly like the shirtsleeves look - these figures could be used for militia gun crews and add variety to the Foundry/Perry crews in uniform coats. I can't quite put my finger on it, but these sculpts just look the business. That's why I decided to paint them in a more "weathered" look than usual, with lots of soot, dirt and stains on their uniforms; I also tried to add some powder burns to the faces of a couple of the gunners. There's a certain nervousness in the poses and faces, that I think expresses the look of men in the middle of battle. It's hard to explain - sometimes sculpts just seem to come alive. I gave the figures all stubble to help suggest that "been at it all day" look of the Troiani painting. As for the faces, see if you can spot Homer Simpson and British actor Geoffrey Palmer..... The colours of Molly's clothes are taken directly from the painting. In short, a lovely set. I understand that Eureka are looking at a summer release for these figures. They deserve to shoot to the top of any AWI gamer's wants list. Many thanks to Nic and John Baxter for giving me a sneak peek. 9 figures. Painted February 2008. Guns by Foundry. Work is continuing to play havoc with my painting schedule. Paiting time during the week has all but stopped and next weekend I will be away on business in Scotland. The following weekend is Easter and from then I will be on holiday for 2 weeks. The Kiwi and I are going to Boston followed by a few days in South Carolina - AWI heaven. Apparently the Kiwi has always wanted to visit Boston; even after I'd spent about an hour telling her about the beginnings of the Revolution she was still keen to go there....My particular aim is to take plenty of photos of period buildings, as reference for those excellent chaps at Tablescape. I see there's a tavern at Lexington (or is it Concord? 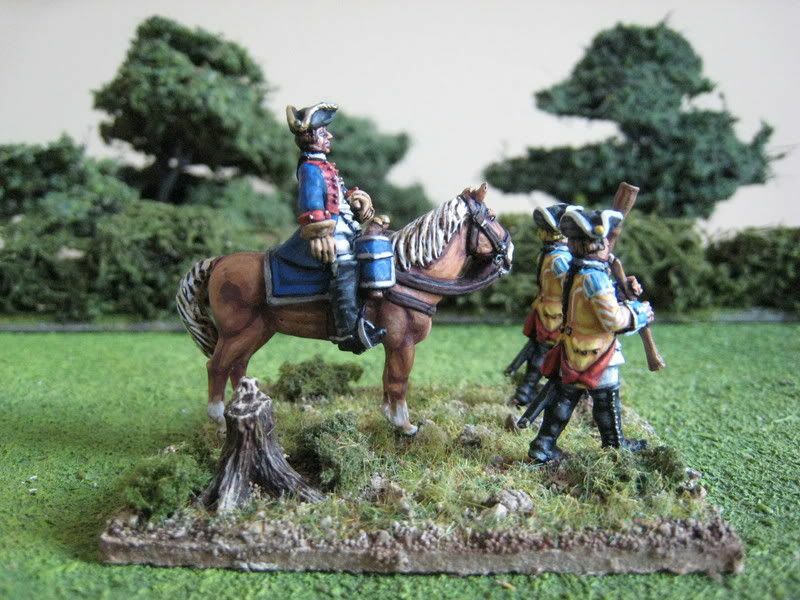 ), a model of which might look good on a wargames table. I have some photos of the soon-to-be-released Eureka Continental artillery to post next week, but here are a couple of (not particularly good) photos of what's on the desk. 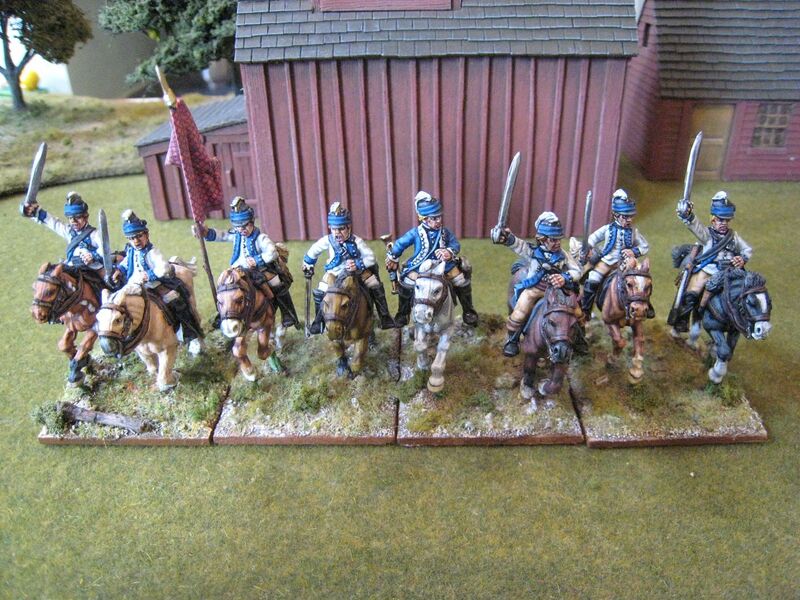 In the last week of February I changed my mind about having a bash at another Saratoga regiment. I didn't manage to finish it before the end of the month, but the 62nd Foot (above) is now all ready for the final stages of basing. Proper pics might be up by the end of the next week. When I visited Perry HQ at Christmas I was particularly taken with Alan's 24th Foot that also comprises these charging figures; Dave Woodward had done a fantastic job on their faces, giving them proper, and not a little bit scary, grimaces. 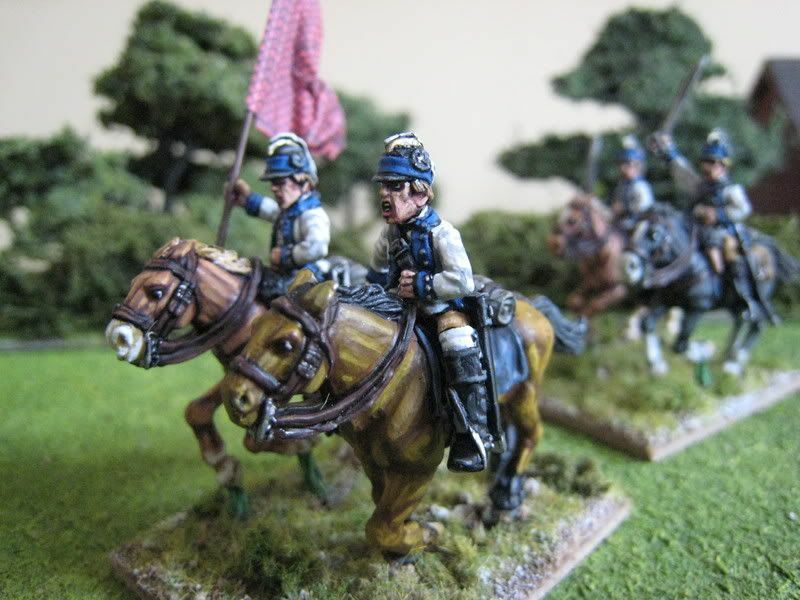 Below are two pictures of my current regiment, the 84th Foot or "Royal Highland Emigrants". 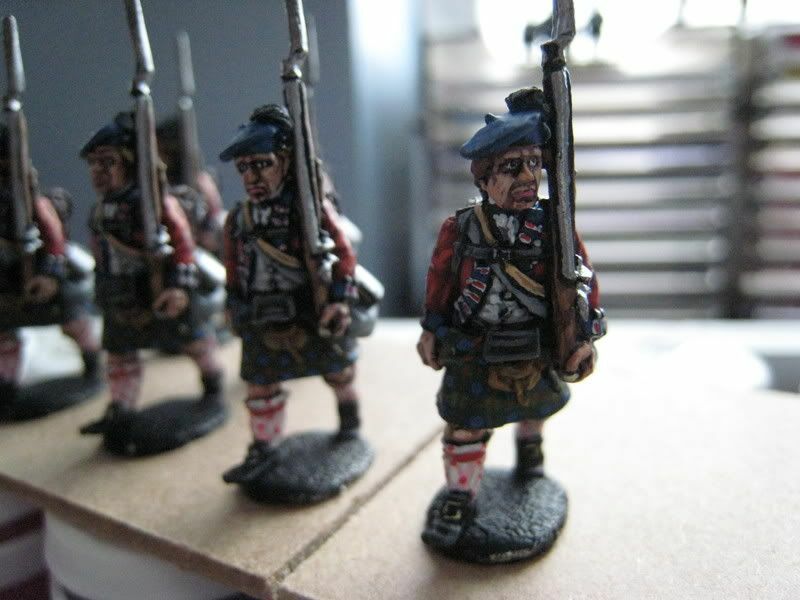 I felt like painting some highlanders again as my painting style has changed a bit since I last painted some (the two battlions of the 71st back in 2006). 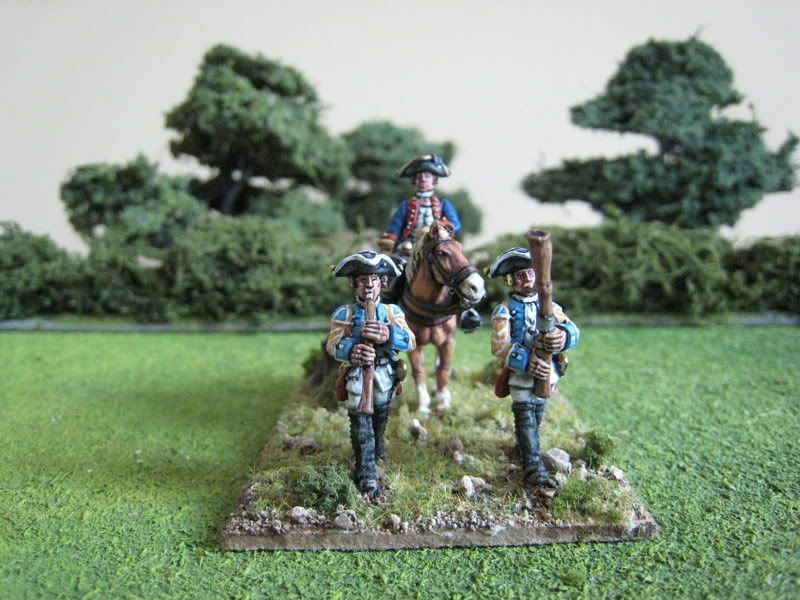 The immediate inspiration came from the Eutaw Springs scenario in the new "British Grenadier! ", which requires a battalion of the 84th; I think also we have a reader who had an ancestor in the regiment? 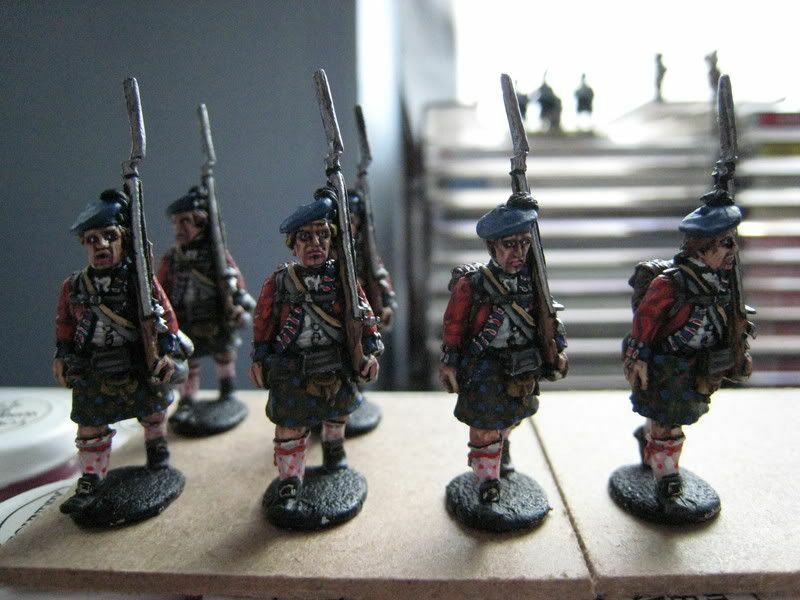 Whilst I was painting the first batch I posted a step-by-step on painting the tartan plaid on the WD3 forum, which may be of interest: see it here. Von Breymann was one of the Brunswick officers who was employed in Burgoyne's Saratoga campaign. He was the colonel of a Brunswicker combined grenadier battalion and commanded the Advance Corps, which consisted of a detachment of Hesse-Hanau artillery, Barner's light battalion, a company of jaegers and Breymann's own grenadiers. Brunswick was in fact the first German state to sign a treaty with Britain for the supply of troops (4,300 men in total). Breymann didn't fare well in the campaign. He was wounded at Bennington, where in command of the relief force Breymann failed to arrive in time to save a foraging expedition (and was criticised by Burgoyne for contributing to that disaster by marching too slowly). Breymann was then killed at Bemis Heights in the redoubt that was named after him, possibly shot by "friendly fire". These figures are from Eureka's Seven Years War Saxons range. This range is more suitable as Brunswickers than Perry Hessian figures (for example) because of the larger cuffs and the arrangement of the buttons on those cuffs. 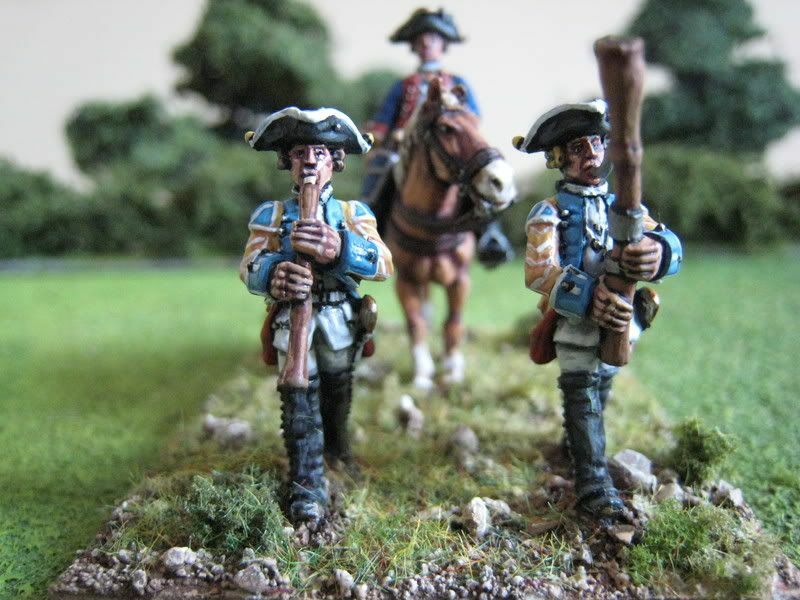 Mollo also has the Brunswick toops in black gaiters, which most Perry figures do not wear. These Eureka sculpts are a bit smaller than Perry/Foundry figures but not excessively so; grouped together they look fine. Although I have no doubt that in real life Burgoyne's army would not have ferried bassoons and oboes around the Hudson Valley, I reckoned that a colonel who had been criticised for taking his time on the march would be the kind of person who would enjoy having his own band. We know next to nothing about Breymann and this vignette probably does him a great disservice, but it looks neat and these Eureka musicians are really quite diverting sculpts. The yellow and sky-blue uniforms were particular to Brunswick musicians and deserve plenty of tabletop exposure. Modern oboes and bassoons come in all kinds of shades of brown and black, but I painted these in standard natural wood on the basis that this is probably authentic for the late 18th century. Painted February 2008. Tree stump from Front Rank. The 3rd Regiment of Light Dragoons was raised in January 1777 by Colonel George Baylor, who had previously been an aide-de-camp of Washington's. The regiment seems to have been engaged at Brandywine and Monmouth, before moving to the southern theatre at the end of 1779. By that stage command of the regiment had been given to William Washington, cousin of the army's commander in chief and only 26 at the time (Baylor had been captured). It was in the South that the regiment won most of its fame. 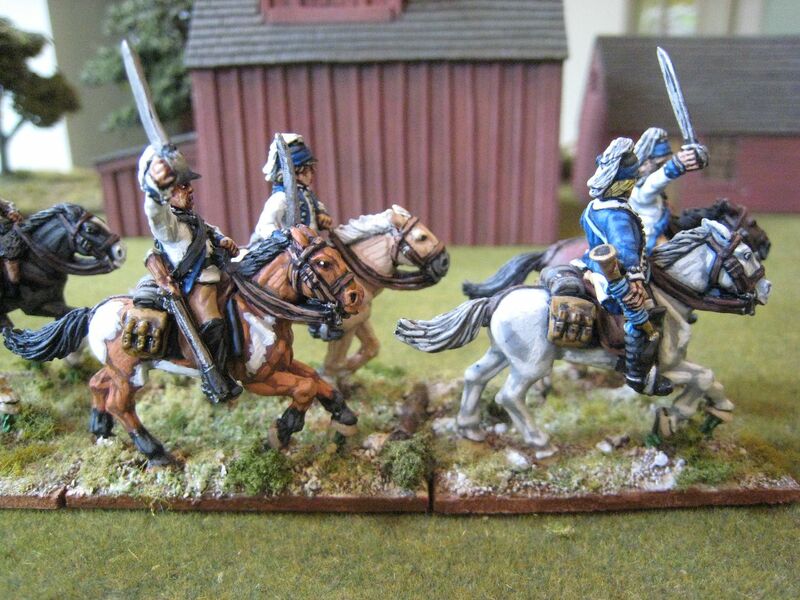 It bested the 17th Light Dragoons at Cowpens and charged the British Foot Guards at Guilford Courthouse. There is an excellent re-enactors site here. I have had 4 packs of Foundry light dragoons sitting under my desk at work for what must be at least two years. 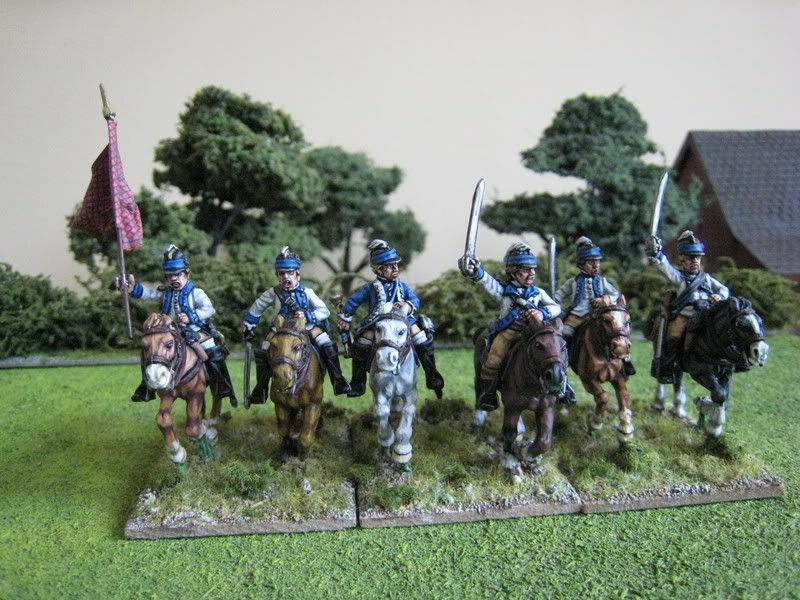 When Henry Hyde, editor of Battlegames magazine, asked me if I could take some photos of a Guilford Courthouse set-up I realised that I had no American cavalry at all and so decided to paint up a unit as soon as possible. 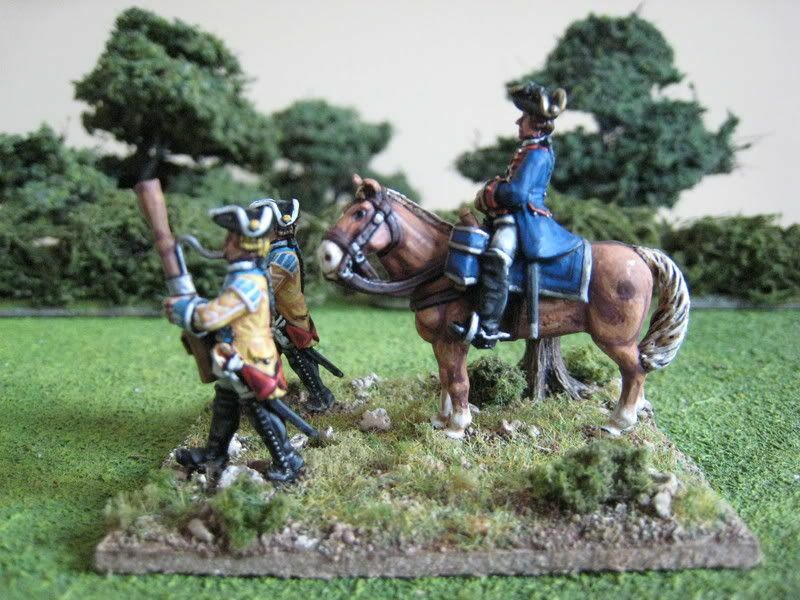 The 3rd was an obvious choice as it is the regiment that features most regularly in "British Grenadier" scenarios (4 figures for Guilford Courthouse, 6 for Hobkirk's Hill and then 8 figures combined with the 1st Dragoons for Eutaw Springs and Cowpens). It is also the only cavalry regiment I had a flag for - "Flag Dude" make a simple red design that seems to have been carried by the regiment at some stage. 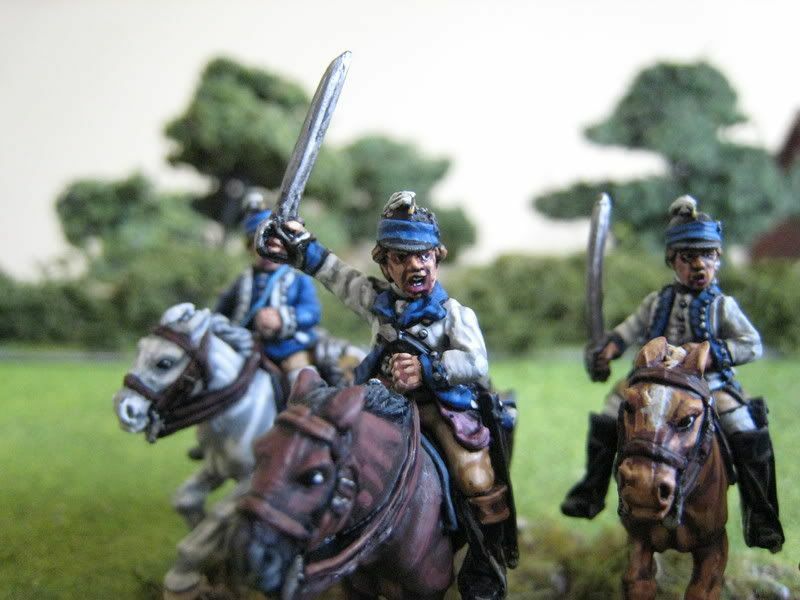 Research suggested some uncertainty as to the exact shade of blue for the coat facings - Mollo suggests sky blue (although the text makes clear that this is an officer's uniform) whilst Troiani and others suggest a darker, "medium" blue. I began with sky blue but in the end went with Troiani because the trumpeter, with reverse colours, just looked so odd. All that's left of the original sky blue colour is the musician's trumpet cord. 6 figures. Painted February 2008. Flag from Flag Dude. 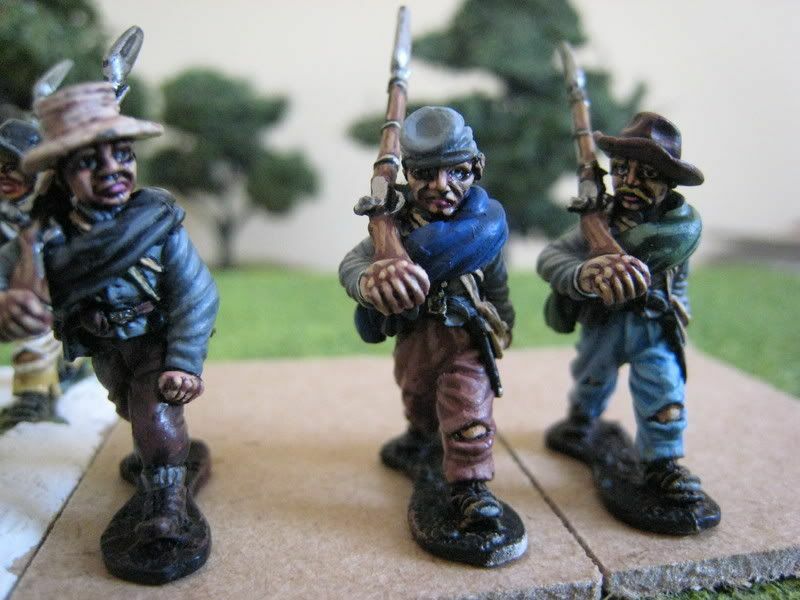 UPDATE: a further 2 figures were added in April 2017 to take the unit up to 8 figures for the Indian Field scenario (as per the photo above).